In the 15 years that the Golf Digest Hot List has been around, the number of average golfers using hybrids, according to industry research firm Golf Datatech, has nearly doubled to reach more than 80 percent, with the average golfer carrying two hybrids. So if all the golfers who need these long-iron replacement clubs already have them, why should they still be thinking about new ones? Two things: The new hybrids fly higher, fly farther and land softer than everything that’s come before. And, almost as important, average golfers may need more of them than they think. Think of the hybrid as what it feels like to hit a perfect long iron, or even a middle iron, without the luck or quite simply the overwhelming difficulty. Because of the way iron sets are being designed today, the lofts on long irons are both stronger and compressed together. That means less loft will make it harder to launch the ball properly and the lofts being too close together means you won’t get large enough distance gaps between these clubs to make it worth having them take up space in your bag. So, rather than having an essentially useless 3-, 4- or 5-iron (maybe even a 6-iron) in your set, consider the hybrid and more hybrids as the solution to both distance and height. Add in forgiveness, too, because these under-sized, fairway-wood-like clubs provide more perimeter weighting so those mis-hits still get energy the ball. One other thing, those wide soles of a hybrid making them easier to power through both tight and heavy lies, giving more muscle to shots you didn’t think you had. What’s become increasingly remarkable about hybrids is how the faces are becoming nearly as flexible as drivers, thanks to the use of specially heat-treated stainless steel inserts or wraparound cupface constructions or even accordion-like channels in the sole that help impacts low on the face to spring away with new found velocity. Internally, as weight is stripped away from less than vital areas of the crown, more weight can be positioned low (much more than you could ever hope to free up on an iron) so these new hybrids launch the ball higher, which also means they’re coming into the green with the kind of steeper angle that will keep them on target. Finally, two other things are happening in hybrid designs today. First, better players can choose these same forgiveness and distance benefits of hybrids but in a compact shape without so much natural draw bias (some even throw in adjustable weighting to further counteract that trend). Meanwhile, average players can find all the high-launching stability they desire with a larger-form hybrid. 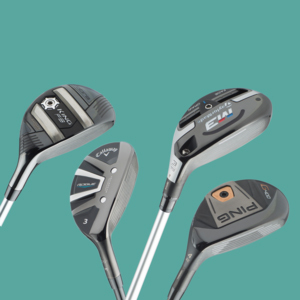 What’s more hybrid designs have learned to change as they move up in loft, getting smaller but still finding ways to beat whatever it was you thought you could do with your perfect iron shots. Because at the end of the day, that’s what today’s reenergized hybrids really are: The perfect iron shot you can’t hit that now you suddenly can. 1315 W. Ben White Blvd.